0 Members and 75 Guests are viewing this topic. I'm glad to see you are working on UEFI compatibility Jerry. I first installed the beta without an internet connection. It installed without a problem. Linux Lite was not an option in Grub when I rebooted. I tried the install again while connected to the internet. I received the error below. "The 'grub-efi-amd64-signed' package failed to install into /target/. Without the GRUB bootloader, the installed system will not boot". I have 6 other Ubuntu based distros on this PC that installed and run without a problem. They are Ubuntu 16.04, Peppermint OS 7 respin, Bodhi Linux 4.1.0, Ubuntu Mate 16.10, Zorin OS 12 beta and Black Lab Linux. I restored Grub by booting into Peppermint OS 7 on a flash drive and running Boot-Repair for Grub2. ...interesting that you experienced the same problem that I reported in post #106 of this thread, while installing the LL3.2 uefi testbuild, when connected to the internet. So, if I am not connected to the internet will the 'grub-efi-amd64-signed' package install okay? Is the internet connection the source of the problem? details, as I would like the LL3.2 testbuild installed instead of Linux MInt 18, for the dualboot with win10 on my uefi laptop. Sorry I haven't been able to get back to you sooner. The installation completed without an error when I wasn't connected to the internet. Unfortunately, Linux Lite was not listed in Grub. I don't know if I could have done something to fix that. Grub was updated from the install since my Peppermint OS 7 Grub screen was gone. I received the error when I ran the installation connected to the internet. I was able to boot into Linux Lite without a problem after I fixed Grub with Boot-Repair. I wasn't able install Linux Lite software, Install Updates or run Synaptic. I received different error messages when I tried all those. I booted into Linux Lite tonight. I opened Terminal and ran sudo apt update. I then ran sudo apt upgrade. I rebooted when it was done. I am now able to install software via the Lite Lite Software installer and Synaptic. I ran Install Updates without a problem. It did not find any updates. It could not search for updates before. Could anybody tell me how to get the great Linux Lite boot splash? It didn't install for some reason. It looks much better now it's not so bright. I saw it when I booted Linux Lite from the flash drive. Ok, it was a while in between me first installing the UEFI test build after reading the forum post. I will follow directions now. Secure Boot is not enabled, UEFI is enabled. I just performed a standard install. The only thing different is I clicked Something Else for partitioning. I created a Root partition only. I have a multi boot box so I already had a Swap partition that is shared amongst the distros. I have a multi boot box with 7 different versions of Linux on it. Installed Linux Lite twice. The first I did it without an internet connection. The install completed successfully but Linux Lite was not listed in Grub when I rebooted. I rebooted the PC and came upon the Grub Rescue screen. I had to use Boot-Repair via a USB flash drive. Grub was restored and Linux Lite was an option in Grub. I booted into Linux Lite. I opened Terminal and ran sudo apt update. I then ran sudo apt upgrade. I rebooted when it was done. Jerry, do you have any updates on how the UEFI version is going? Thank you for testing. If you Google the error message, you'll see there are any number of causes and solutions. This is just one of the reasons I detest this horrendous technology and am against it. There are no plans for any more UEFI builds this Series. Cheers. Sorry to hear that Jerry. I'm glad I have Linux Lite on here now. Using the cheat to install it without UEFI compatibility caused a problem on my system. I had trouble wiping a partition to try a new version of Linux. I had to wipe the drive and start over again. I only use UEFI distros now. Hopefully you can get it worked out in the next series. I put two people on Linux and would have liked to use Linux Lite but couldn't because it's not compatible with UEFI PCs. You have an amazing distro. It's not just Ubuntu with a different skin. Thanks for the great distro. 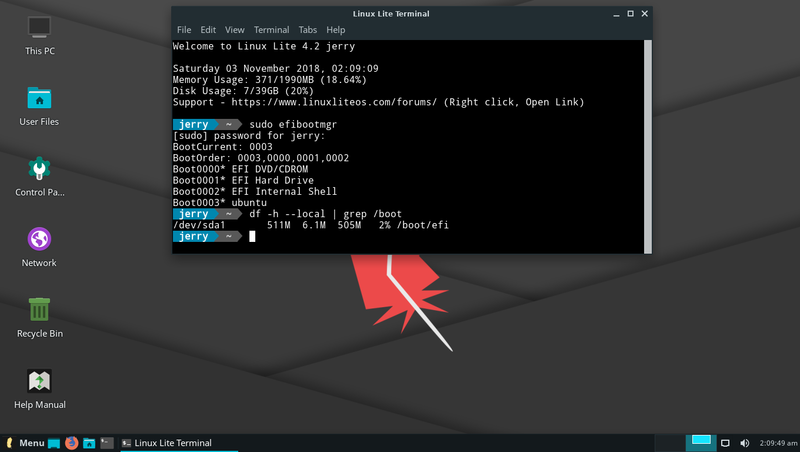 I am using UEFI pc, not using UEFI, with Linux Lite 3.2. To have got this to work in CSM/Legacy mode on a UEFI PC, did you use an MSDOS ext4 formatted HDD? Or did you use some other formatting/drive combination for the UEFI-LLtestbuild? - OEM Manufacturers - run oem-config-prepare after first install. I would like to hear from folks who can test this install with both UEFI & Secure Boot enabled on any machine (no VM tests please). This is no indication that LL will start producing Linux Lite with UEFI support, this is simply an experimental project and perhaps the only chance to get a Series 4 UEFI build. This build is supported by the community. The community is welcome and indeed encouraged to support each other with this build. Credit to BodhiBuilder https://sourceforge.net/projects/bodhibuilder/ for providing the software, which we slightly modified to work with our operating system. Dual boot with Win10; LL4.2 installed to external MMC (SD) card. I created a USB (in Windows) from a separate system via Win32disk and the LL4.2_64bit UEFI ISO.. I booted the USB with secureboot enabled and into the Live Environment. I checked disks, removed old LL3.x partitions all together. Started the Install from desktop - using the newly creates partition. All options were "default" with the exception of "Something Else" (didn't download updates nor 3rd party) - English locales and skipped the connection to WiFI (wifi only for this device). I installed the the boot manager to mmcblk1, the same where LL is installed. Install was simple, straightforward and quick as usual. After Install = Checked for updates which inform I'm up to date. *Update I have since removed VBox - is faster .. ~30sec boot time. There may have been an error on boot about "failed mem for rom" that blinked up on the splash but I'll update after a reboot (I started this post).. So far so good and yet another good looking rendition!!! Bug found. /etc/apt/sources.list. folder is missing all the 3rd party repo including LL and other files. Will look into it.